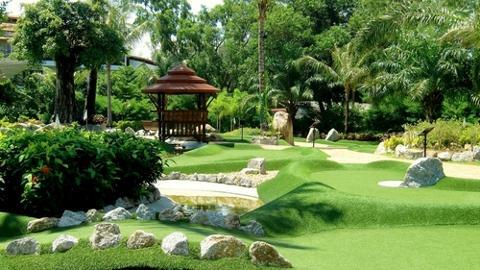 Putt your way through a day of fun by trying your hand at Adventure Golf, a mix between normal and mini golf. 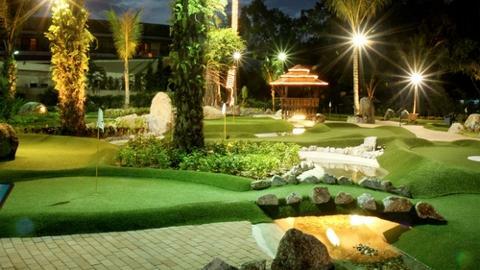 Enjoy a lush and balmy open-air course of 18 mini golf holes designed to look like a professional course. After your game, savor a satisfying meal in a nearby restaurant. 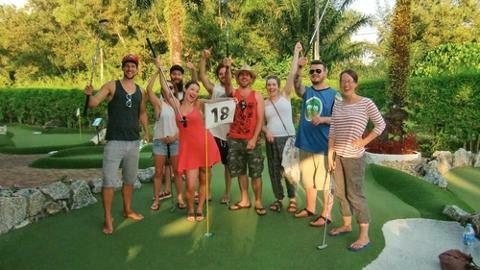 Kick off your game feeling like a pro with convenient transfer from your hotel to Phuket Adventure Mini Golf. Pick out your putter—3 sizes are available for golfers of all ages—and head out to the green. 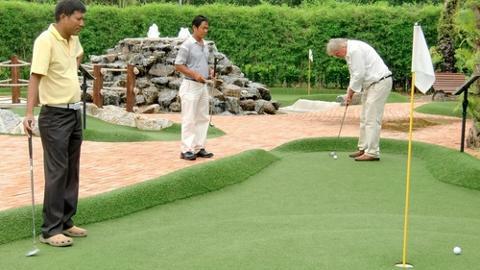 A unique blend of normal and mini golf, Adventure Golf is played on artificial grass with just a putter and a ball. When you step out onto the course, you're surrounded by natural palm trees, bamboo plants, rocks, and water features, creating a tropical experience. Play your way through 18 original holes that take inspiration from full-length, professional courses. The course offers a challenge for experienced players while being a blast for beginners too. 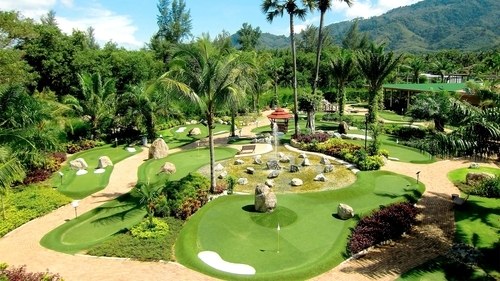 Enjoy the warmth of the sun and the feeling of playing in paradise as you make your way around each hole. At the end of your game, reward yourself with a sumptuous meal at a nearby restaurant, and then get dropped off at your hotel. This activity is not recommended for children 3 and younger. You must be 20 years of age and present a valid photo ID in order to consume alcohol. Roundtrip transportation is available from most centrally located Layan, Nai Yang, Cherngtalay, Bangtao, Surin, Kamala, Kalim, and Patong hotels. An additional surcharge for pickup outside these areas is applicable. Please arrange pickup from your hotel or a nearby location when you call to confirm your reservation. Hours of operation are 11 AM–11 PM. You will receive confirmation of your exact activity start time when you call to confirm your reservation.